The following describes the elements essential for one's business to become operationally excellent. This blueprint or recipe for operational excellence, in a step-by-step order, enable business growth to the next level. These steps lead to success, in the order listed. Deviations in the order can be made, where it makes sense for you and your business, but don't stray too far. Business management planning, like a cooking recipe, you usually don't tamper with a recipe until you've followed it exactly at least once. 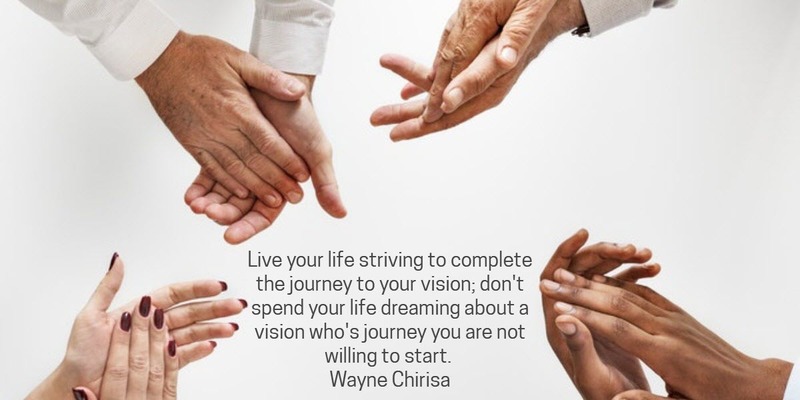 Vision describes a mental picture of what lies at the end of a road never traveled before, and a Business Vision Statement articulates the future status of the business. The Vision Statement describes the future: where the business goes or where management wants it to go. While the Mission Statement, part two, describes today: why the business exists today and/or what management does to pursue the vision of the future. Together they provide direction for the business by focusing attention on doing things day-to-day to accomplish the mission, while taking steps to pursue the vision of the future - the long-term business intent. You get much more mileage and buy-in with the Vision Statement when word-smithed in a group (the team) setting. You can accomplish the end objective much more quickly when you start with a straw man versus a blank sheet of paper. When published after group input, the team shares the vision. Those who participated feel personal ownership of the Vision Statement. Note: From a chronological standpoint, out of need, usually the team creates the Mission Statement first. The team formulates the Vision Statement after the business progresses to the point of viability and profitability. However, from a business management planning or business model perspective, the team lists the Vision Statement first. The team creates and publishes a Mission Statement, as a means of giving the members of an organization, associates, stakeholders, and customers a uniform perception of the purpose of the business. The business purpose expresses the reason why the business exists. The Mission Statement, describes today: why the business exists today and/or what management does to pursue the vision of the future. Together, Mission and Vision, provides direction for the business by focusing attention on doing things day-to-day to accomplish the mission, while taking steps to pursue the vision of the future - the long-term business intent. Again, as in the process for the Vision Statement, create it with your staff and/or team to gain consensus and buy-in, then publish and communicate it. Those who participated feel personal ownership of the Mission Statement - everyone owns the result. A key component of business management planning, to enable success, is creating the Business Values Statement. This statement which goes lock step with employee handbooks portray the culture and ethics that define the expected company and employee behaviors. They should be the fundamental principles (AKA Values) by which the company conducts its business. Some companies publish theirs, and some don't. However, with today's onslaught of major accounting practice frauds that obliterated employee pension funds and investor monies, legitimate companies must state their positions relative to ethics. Companies that do, at least get categorized as having "good intentions"... those that don't seem to fall in the other category, in general, of not having "good intentions". Business ethics cross many subject areas. Companies determine these on broad principles of integrity and fairness regarding issues such as accounting practices, product quality, customer satisfaction, employee wages and benefits, local community and environmental responsibilities, etc. If you could sum Principles / Ethics up in one other word it would be Integrity. A solid ethics statement, documented as the Company Principles / Values Statement, creates team commitment and understanding relative to how the company desires to operate. It enables your team to operationally focus accordingly. It enables others who read it to understand how the top of the organization visualizes the ethics of the company. Do not forget ethics in your business management planning. An Operational Business Model is an operational plan to enable the business to accomplish the mission, and achieve the vision. An Operational Business Model, also known as a three-year or five-year operational business management planning , usually consists of the company's / organization's vision statement, mission statement, values statement, scope, objectives, strategies, and initiatives - a plan to follow to enable the business to accomplish the mission, and achieve the vision. One should exist at the corporate level reflecting the Company's plan, and each down-the-line reporting organization should have their own which dovetails into the corporate version. By following this "blueprint" you get closer to completing your Business Model. Your Vision, Mission, and Values Statements compose the main components of the Business Model. The thought process to create the rest of the Business Model enables you to focus on the future as well as the present; provides the mission to accomplish the vision; provides the objectives, strategies, and initiatives to accomplish the mission. It drives you to take the steps to accomplish the vision. The process enables you to look three to five years into the future, and lay out the appropriate objectives, strategies, and initiatives to get there. In short, you end up with the recipe to take your business to the next level. During this business management planning phase, you do the necessary brainstorming to formulate the objectives and strategies to pursue in order to elevate your business to the next-level. Objectives would be broad-based statements of what you want to accomplish. Each Objective includes one or more supporting strategies which indicate the things you need to do to accomplish the objective. foster an environment that stimulates professional excellence and encourages contribution by all employees. Then, when you have completed the Business Model with business management planning , you have a documented Business Model. You can then periodically (quarterly, annually at a minimum) review status and compare the plan to reality. This allows you to assess what worked, what didn't, and to do some tweaking of the plan to enable greater and quicker strides toward the vision. Regular reviews of the objectives, strategies, and initiatives (housed within the Operational Business Model) enable the team to re-focus on items to be accomplished. The review process enables you to redirect strayed actions and initiate new ones based on lessons learned such as changes in the marketplace, changes in technology, etc. The Business Model from business management planning and its review provide the capability and tool for you to proactively manage the enterprise. This prevents "flying-by-the-seat-of-your-pants", confusion, chaos, and luck to manage the business and the future. Good business management planning is the key to success and starts with planning and setting goals. That is what an Operational Business Model is all about.